Photographs by Karli Cadel and Carrington Spires, courtesy of the Glimmerglass Festival. 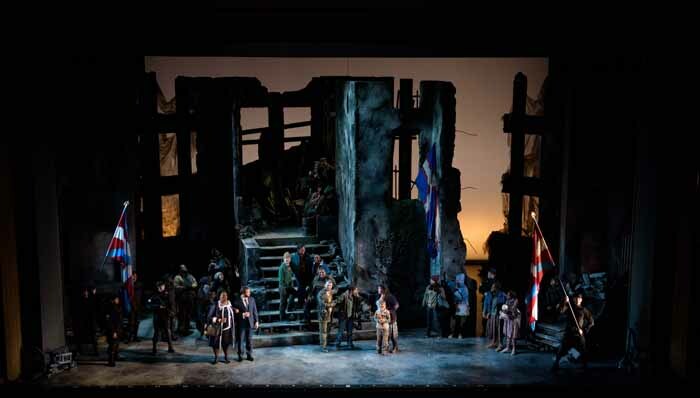 This was the U.S. premiere of Donizetti's opera L'assedio di Calais retitled in English as The Siege of Calais. Charles Jernigan saw the July 16 performance and has contributed the following review. Gaetano Donizetti was in Naples. His Lucia di Lammermoor had premiered there in 1835 to enormous acclaim, and now the composer from Bergamo set his sites on the goal of every Italian opera composer of note at the time--Paris, the center of the musical world. 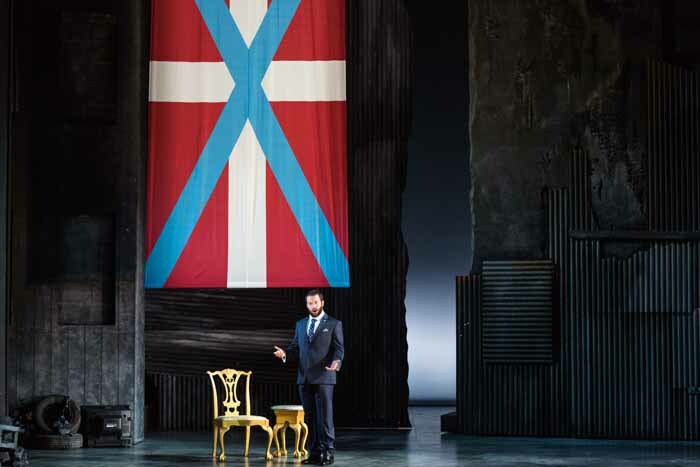 He wanted a commission to write a new opera for Paris and he enlisted his friend, the tenor Gilbert Duprez, to help him out; so, for his next opera for Naples, he decided on a subject and a format that might gain the attention of the French and act as a calling card. The subject was based on French history, and patriotic--the siege of Calais, a memorable event in the Hundred Years' War when the French coastal town was besieged by the English forces under their king, Edward III, in 1346-47. Edward promised to lift the siege from the starving city if the townsmen would give of six of their leaders as hostages to be executed at his will as a warning to their compatriots. Six men volunteered to go and the moment became immortalized in French history, and in art, most famously in Auguste Rodin's statuary group, "The Burghers of Calais." Ultimately, the six were pardoned at the behest of Edward's queen, Philippa (called Isabella in the opera). Donizetti's 1836 opera was based directly on a ballet which told the story, and that in turn was based on a couple of plays. Although the libretto by Salvadore Camaranno was in Italian, Donizetti introduced several innovations in the French style: most obviously there was a ballet, something common in French opera, but very unusual in Italian works of the time. There are also big crowd scenes, and the ensemble singing is more important than the individual arias. The orchestration is also more involved than most Italian opera of the period, and there is no really central prima donna role as was typical in Italian opera--such as Lucia or Norma or Cenerentola. One feature of L'assedio di Calais, however, is very Italian--the use of a contralto musico, a woman, to sing the pants role of Aurelio, an heroic leader of the citizens of Calais. 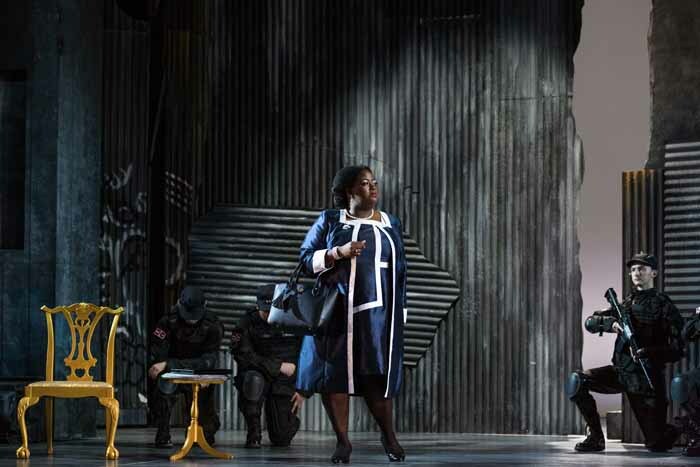 Casting women in heroic pants roles was common in Rossini (Tancredi, Arsace), a leftover from the era of the castrato, but it was an unpopular tradition in France, and it was by then on its last legs in Italy too. The reason that Donizetti cast Aurelio with a contralto or mezzo-soprano was really dictated by the fact that in 1836 there was no tenor in Naples capable of such a role, and there was a very talented mezzo who was used to singing pants roles. Undoubtedly, if the opera were ever to be played in Paris, Donizetti would have rewritten the role of Aurelio for a tenor, probably Duprez. The beginning of the opera is unusual too. 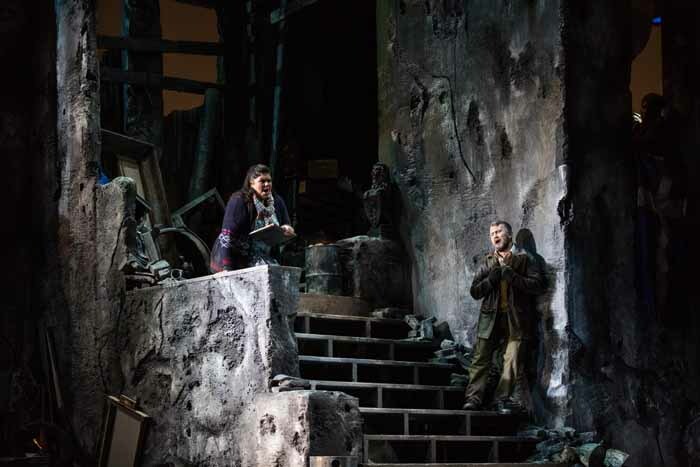 There is no overture, and the work opens with an extended pantomime action in which we see Aurelio scale the city wall and sneak into the enemy (English) camp to steal food for his starving fellow citizens. The first singing is a vigorous military chorus as the English soldiers spot him and give chase, but he escapes. After that exciting opening--in medias res--the first two acts give us the events taking place inside the besieged city, leading up to the demand of Edward for the lives of some sacrificial soldiers. We are focused on the tragic interactions of the leader of people of Calais--Eustachio, his son Aurelio and Aurelio's wife, Eleonora. Act III moves to the English camp, where, for the first time, we meet Edward III and his wife Queen Isabella. Isabella arrives victorious from battles in Scotland and there is that ballet to celebrate her arrival, as out of place as a ballet might seem set outside the walls of a besieged fourteenth century city. The six victims come forward to offer themselves as a sacrifice, the women of Calais follow them to beg for mercy. 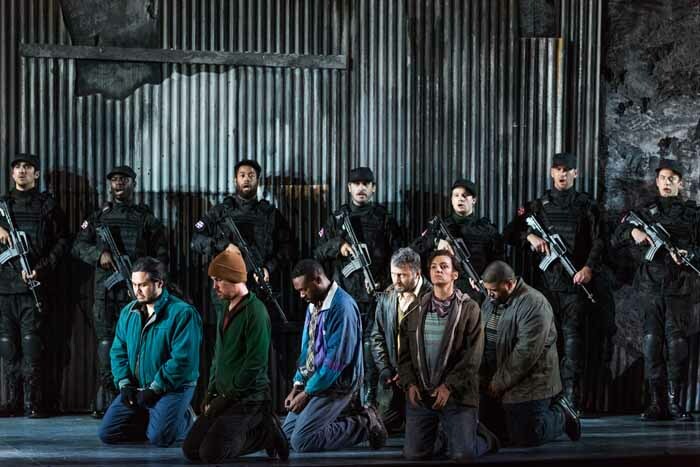 One of Donizetti's most beautiful ensembles ensues as Aurelio bids farewell to his wife and young son, developing into a powerful movement ("Raddopia il pianto"); Queen Isabella then pleads with Edward to relent, and he pardons the burghers of Calais to much joy. Thus this opera, like many of the period, has a lieto fine, a happy ending, mainly because the monarchs of Naples did not want tragedy and certainly did not want a monarch (Edward) to be seen a cruel. According to Alexander Weatherson, Cammarano and Donizetti changed the name of the English Queen to celebrate the birthday of the Queen Mother of Naples, whose name was Isabella and dedicated the score to her. The festive ballet was a kind of birthday gift to her. It worked: the King congratulated the composer. 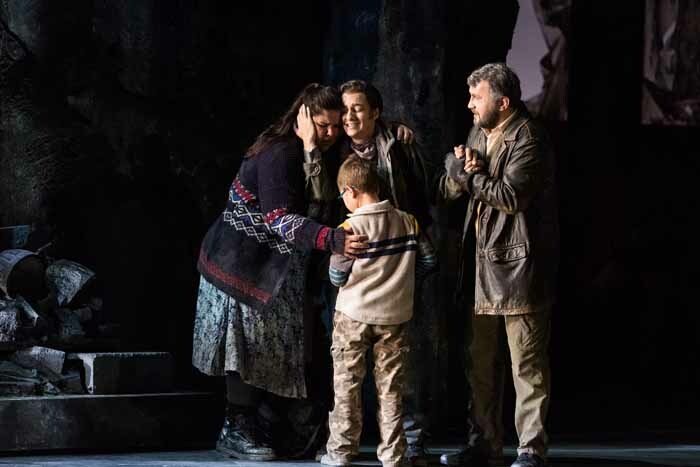 Donizetti's opera is in three acts and the first two are very powerful and filled with beautiful music, but the third act is a problem, and that is what has probably caused The Siege of Calais to be almost unknown in our time, and not particularly successful when it was composed. Musically, the third act has a rather perfunctory and bouncy aria for Edward III, the ballet (Donizetti himself wrote only two of the four dances), the gorgeous ensemble mentioned above and a highly unlikely happy ending. Donizetti knew that the last act was weak, and made some attempts to improve it, considering changes, cuts and the addition of a rondo finale for the soprano (Eleonora), but he was never able to put definitive changes in practice, nor was the opera ever performed in France. Modern productions have been few and far between in Europe (I am aware of only three professional ones) and there is only one recording (on the Opera Rara label). The production in Glimmerglass which we saw on July 16 was the American premiere. To solve the problems of Act III, the English Touring Opera made some major changes, moving the King's aria to Act I and turning the happy ending into tragedy, and indeed, everything about the opera portends tragedy, so it is not surprising. The Glimmerglass production cuts the ballet but keeps the happy ending by using the rondo finale that Donizetti wrote (but which was never performed in his time; it appears as an appendix on the Opera Rara recording). The happy rondo does offer a vocally bravura ending and it does give the soprano a big aria (something which she does not otherwise have), but it is not top drawer Donizetti-- considerably below the quality of the great music that has come before. Now Odyssey Opera in Boston promises a production of L'assedio di Calais in October; we shall see how they solve the problems posed by Act III. The Glimmerglass production also divides the opera into two acts, which means that there is only one intermission, and the performance is shorter, but it means that Acts I and II do not end with the big ensembles which the composer intended as climactic moments. Director Francesca Zambello also updates the era to today, drawing her inspiration from the tragic events in Calais as thousands of refugees from our own "hundred years wars" flooded that French city, hoping to get to England. The impressive set of a bombed out city could have been taken from the nightly news -- Mosul or Palmyra or Damascus. The color was monochrome cement gray; the chorus were Syrians or Afghans or refugees from any number of the world's tragic places. It worked up to a point because war ravaged populations are as present today as in the terrible fourteenth century, but one had to wonder when King Edward III appeared in that troublesome Act III; a modern king in a blue suit and a tie did not fit the story, and the surtitles had to be changed to expunge references to the French and the English. In the modern version, the refugees could be from anywhere and their "flag" was from nowhere. Still, Donizetti and Cammarano's work is so powerful and poignant, it survived the updating better than many another opera. 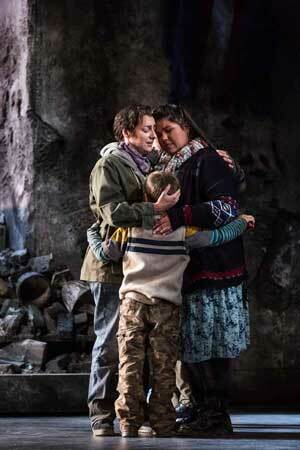 The Siege of Calais is truly an anomaly: an ensemble opera which demands virtuoso singing. The only real display piece is that rondo finale which Donizetti composed after the fact, although there is a splendid mezzo/soprano duet reminiscent of Norma. The best know singer was Leah Crocetto, who brought her powerful instrument to Eleonora; she easily filled the small and attractive Alice Busch Theater, perched in the verdant lawns of the Glimmerglass campus, on the shores of Lake Oswego. I remember her from Rossini's Maometto II in Santa Fe, and she certainly has the chops for the rondo at the end. Aleks Romano, whom I heard sing Arsace in Rossini's Semiramide last May in Delaware, was just as impressive here in the pants role of Aurelio. She is a fine actress and managed to rappel down the corrugated, barbed wire topped, "wall" of the first act. I am sure she won't look at the conductor so much as time goes on. Her voice is full and rich and she excelled in the stunningly beautiful aria "Al mio core, oggetti amati" ("Beloved of my heart"). The major role of Eustachio was performed by one of Glimmerglass' Young Artists, bass Adrian Timpau, and he was very fine indeed. All of the other roles were also performed by Young Artists, including Chaz'men Williams-Ali, Makoto Winkler, Carl DuPont and Joseph Leppek as burghers of Calais, Zachary Owen as an English spy, Andres Moreno Garcia as an English general and Helena Brown as Queen Isabella. Michael Hewitt sang the role of Eduardo III.